You can change EPF name, date of birth, mobile number, father/husband name etc., by submitting EPF Joint Declaration form through your employer. You can find PF Joint declaration form sample and how to use this form for PF corrections offline in this post. This is a Joint Declaration By the Member and the Employer for Pf Correction. Joint Declaration form is required to be filled whenever there is correction required. You have to submit the form to your employer for certain corrections that you require. You can find Epf joint declaration form below in pdf and word formats. Just fill the appropriate fields and submit it to your employer. Your employer should forward it to Epf office by recommending required corrections. So that the required corrections will be made in your epf records. In the proforma that i have provided, you have to update the details that you want to correct under the correct column. PF/EPS Account No. or UAN number is mandatory to update the details. This portal is useful if you have login access. If you forgot password, you can reset it by using your mobile number. If your mobile number is different from the one you submitted during joining time, you should submit join declaration form to correct the mobile number. I will explain how to change the above mentioned details using Epf UAN Portal in my next post. Here is how to fill joint declaration by the member and the employer. Date – Write the date on which you are going to submit joint declaration form to the EPF office. To Address – Write the EPF regional office place. 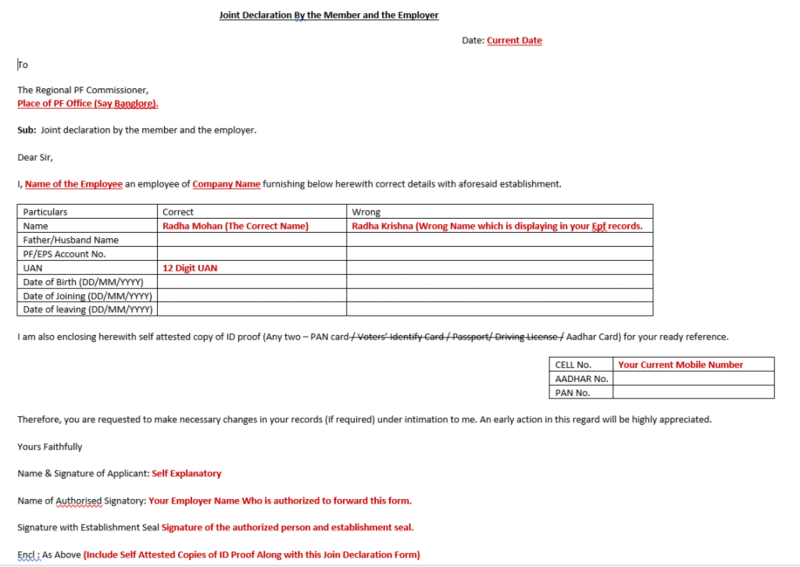 Employee Name and Company Name: Write your name and company name in the next two blank fields. Table – Name: If you want to change name in pf account, you have to write correct name under correct column in the table provided and write down the present record under wrong column for pf name correction. Father/Husband Name: if you want to change father’s name in pf account or husband’s name then write their correct name and wrong name in given fields. In case of women employees, if you want to change your father name after marriage with husband name, you can enter father name under wrong column and your husband name under correct column. PF/EPS Account No. : You have to write your pf/eps account number. UAN: You need to write UAN number for information purpose. Date of Birth: If you want change date of birth in pf account, write your correct and wrong date of births in appropriate fields. Date of Joining and Date of Leaving: You can change date of joining in pf account by writing correct details in correct column and date of leaving also. Cell No. : You can change mobile number in pf account by writing correct mobile number in this field. If you forgot pf account password, you need to enter otp that you receive to your pf registered mobile number. If your correct mobile number was not updated in epf records, you will face problem to reset pf account password. In such cases, you have to submit this joint declaration form to update mobile number. Aadhar No. : Write your aadhar number in this field to update kyc in epf. Pan No. : Write correct pan number in this field for epf kyc update. Once the EPF member or employer submits this PF joint declaration form to the EPF regional office then their details will be corrected within 30 days. Here is the Pf Joint Declaration by the member and the employer filled sample. This is for easy reference while filling the form. Open image in new window for large view. You have to submit the Aadhar card or PAN card self attested copies along with Pf joint declaration form. If you have any problem in filling epf joint declaration form, please comment below. I will try to help you. Thanks for reaching our website. In which cases Joint Declaration form is useful? please correction my basic name. Please submit the pf correction form to your employer. That is the way to epf name correction. If you try to modify basic details in Epf Portal, it will display “**Note: Changes requested should be as per AADHAAR”. So enter details as it appears on aadhar card. In that case contact your employer.